eBoostr 4.5 Pro Full Version - Merupakan sebuah software untuk meningkatkan responsifitas aplikasi dengan menggunakan memori flash dan RAM bebas sebagai lapisan tambahan kinerja-boosting cache untuk PC/Laptop Anda. Gunakan hingga empat perangkat flash murah untuk mempercepat sistem anda. Tambahkan kecepatan ke PC tanpa upgrade Hardware! eBoostr can improve your system's performance immediately, without any need for direction. While eBoostr is running it will also keep track of what programs get used the most frequently. 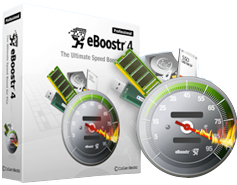 eBoostr then makes sure that programs that get used the most frequently also load the fastest. Helping your experience be smoother, faster, and more enjoyable. Have a program you want to work faster but don't use often? Not a problem. With eBoostr's easy to use interface you can pick and choose what programs you want eBoostr to accelerate.